Top UMP Late Model Drivers showed up for the running of the 20th Annual Barney Oldfield Race at Oakshade Raceway Saturday night. 1991 Barney Oldfield winner Matt Miller once again picked up the win and his second feature victory of the year. Twenty-four cars started the 40-lap event sponsored by Wyse Excavating, Wyse Carts and Leo’s Metal & Wood. Matt Miller and Wayne Chinn had a heated battle for the lead early in which Miller eventually won and began to pull away. A pair of caution flags on lap 10 and lap 13 kept the field tight early, but it was all green flag racing from lap 14 through lap 38. Miller set sail, masterfully working by and lapping slower traffic. At one point, Jon Henry was running second and began to close on Miller. He got to within a few car lengths. Then Miller turned the wick up and once again pulled away. It looked as though the race was all but in the books, but the late caution period with two laps to go tightened the field a final time, giving Jon Henry and Dona Marcoullier one last shot. Miller proved untouchable as he went on to win the 20th Annual Barney Oldfield race and pocketed the $4500. Henry settled for second place. Oakshade points leader Ronnie Perrine Jr. got around Marcoullier in the final couple laps to finish third and Tyler Boggs ended up in the fifth spot. The UMP Sportsman Feature had a very rough time getting started. One lap was finally completed after three complete restarts. Tim Line led that first lap, but then spun in turn two while leading to bring out another caution. Brad Mills inherited the lead until lap 13 when last week’s feature winner, Joe Smith, finally took over after about five laps of side by side racing. Smith proceeded to pull away and went on to his second consecutive UMP Sportsman Feature win. Brad Mills held on to finish second followed by Brice Luttrell, Brian Fisher and Brett Miller. Dan Plath started on the pole of the UMP Bomber A Main and led much of the race with Chris Henry hounding him in second. It was Henry’s first time back in a Bomber since last season, but he looked high and low trying to take the race lead and got alongside Plath several times. Henry finally took over the lead with just two laps to go and went on to pick up his first feature win of the year. Dan Plath finished second with Dan Shaffer and Danny Hogrefe close behind in third and fourth respectively. Jim Scout remains the UMP Bomber point leader with his fifth place finish. Drew Smith’s point lead in the UMP Hornet division shrank after his hood flipped back at the start of the UMP Hornet Feature which forced him to the pits on the first lap. Adam Noonan held off a hard charging Dylan Herman to win his fourth feature of the year and to close to within 16 point of Drew Smith in the point standings. Herman finished a close second followed by Derek Morris, Dylan Kirkman and Tyler Line. Karl Spoores, Matt Lane and Josh Overmyer battled for the early lead of the UMP Bomber B Main with Spoores eventually winning that battle. Matt Lane managed to get by Spoores to win his second Bomber Feature of the year, previously winning a Bomber C Main. Terry Rushlow finished second and Karl Spoores slipped back to finish third. Josh Overyer and Ron Leonard were the rest of the top five finishers. Dean Taylor survived some early pressure from Fred Burtch in the UMP Bomber C Main after Burtch slipped up high in the corner and fell back in the running order. Taylor went on to pick up the C Main victory over Cliff Barnard, Josh Scott and Burtch in fourth. Jesse Moyer was fifth. 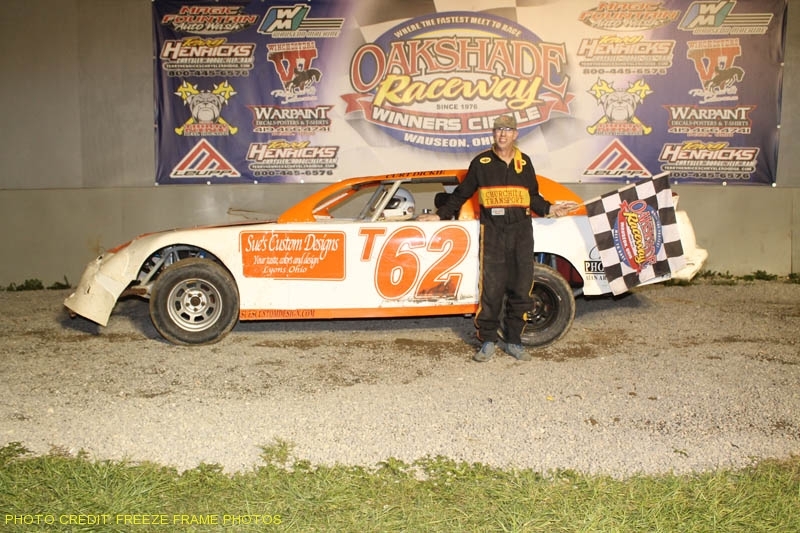 The American Late Model Series returns on the Butch Wildermuth Memorial Night this Saturday at Oakshade Raceway paying $2000 to the Late Model Feature winner. UMP Sportsmen, UMP Bombers and the UMP Hornets will once again complete the racing program with gates opening at 4pm and racing at 6pm.